For other uses, see Becquerel (disambiguation). Antoine Henri Becquerel (/ˌbɛkəˈrɛl/; French: [ɑ̃ʁi bɛkʁɛl]; 15 December 1852 – 25 August 1908) was a French engineer, physicist, Nobel laureate, and the first person to discover evidence of radioactivity. For work in this field he, along with Marie Skłodowska-Curie (Marie Curie) and Pierre Curie, received the 1903 Nobel Prize in Physics. The SI unit for radioactivity, the becquerel (Bq), is named after him. Becquerel's discovery of spontaneous radioactivity is a famous example of serendipity, of how chance favors the prepared mind. Becquerel had long been interested in phosphorescence, the emission of light of one color following a body's exposure to light of another color. In early 1896, there was a wave of excitement following Wilhelm Conrad Röntgen's discovery of X-rays on the 5th of January. During the experiment, Röntgen "found that the Crookes tubes he had been using to study cathode rays emitted a new kind of invisible ray that was capable of penetrating through black paper." Learning of Röntgen's discovery from earlier that year during a meeting of the French Academy of Sciences caused Becquerel to be interested, and soon "began looking for a connection between the phosphorescence he had already been investigating and the newly discovered x-rays" of Röntgen, and thought that phosphorescent materials, such as some uranium salts, might emit penetrating X-ray-like radiation when illuminated by bright sunlight. As often happens in science, radioactivity came close to being discovered nearly four decades earlier in 1857, when Abel Niépce de Saint-Victor, who was investigating photography under Michel Eugène Chevreul, observed that uranium salts emitted radiation that could darken photographic emulsions. By 1861, Niepce de Saint-Victor realized that uranium salts produce "a radiation that is invisible to our eyes". Niepce de Saint-Victor knew Edmond Becquerel, Henri Becquerel's father. In 1868, Edmond Becquerel published a book, La lumière: ses causes et ses effets (Light: Its causes and its effects). On page 50 of volume 2, Edmond noted that Niepce de Saint-Victor had observed that some objects that had been exposed to sunlight could expose photographic plates even in the dark. Niepce further noted that on the one hand, the effect was diminished if an obstruction were placed between a photographic plate and the object that had been exposed to the sun, but " … d'un autre côté, l'augmentation d'effet quand la surface insolée est couverte de substances facilement altérables à la lumière, comme le nitrate d'urane … " ( ... on the other hand, the increase in the effect when the surface exposed to the sun is covered with substances that are easily altered by light, such as uranium nitrate ... ). In 1889, Becquerel became a member of the Académie des Sciences. In 1900, Becquerel won the Rumford Medal for his discovery of the radioactivity of uranium and he was made an Officer of the Legion of Honour. The Berlin-Brandenburg Academy of Sciences and Humanities awarded him the Helmholtz Medal in 1901. In 1903, Henri shared a Nobel Prize in Physics with Pierre Curie and Marie Curie for the discovery of spontaneous radioactivity. In 1905, he was awarded the Barnard Medal by the U.S. National Academy of Sciences. In 1906, Henri was elected Vice Chairman of the academy, and in 1908, the year of his death, Becquerel was elected Permanent Secretary of the Académie des Sciences. During his lifetime, Becquerel was honored with membership into the Accademia dei Lincei and the Royal Academy of Berlin. Becquerel was elected a Foreign Member of the Royal Society (ForMemRS) in 1908. Becquerel has been honored with being the namesake of many different scientific discoveries. The SI unit for radioactivity, the becquerel (Bq), is named after him. There is a crater named Becquerel on the Moon and also a crater named Becquerel on Mars. The uranium-based mineral becquerelite was named after Henri. ^ "Becquerel". Random House Webster's Unabridged Dictionary. ^ "The Discovery of Radioactivity". Berkeley Lab. ^ a b Henri Becquerel. [S.l. ]: Great Neck Publishing. 2006. ISBN 9781429816434. OCLC 1002022209. ^ a b c d e Badash, Lawerence (2018). 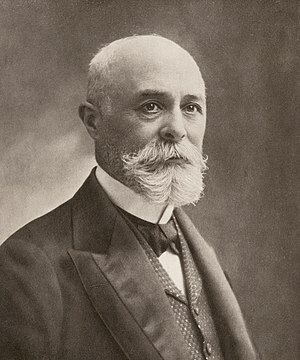 "Henri Becquerel". Encyclopædia Britannica. Retrieved 6 March 2018. ^ Karbowski, Andrzej (2012). "Biography: Henri Antoine Becquerel (1852 – 1908)" (PDF). Storytelling @ Teaching Model. Retrieved 13 April 2018. ^ a b "Henri Becquerel - Biography, Facts and Pictures". www.famousscientists.org. Retrieved 6 March 2018. ^ a b c d e f Henri Becquerel – Biographical. Nobelprize.org. ^ a b Tretkoff, Ernie (March 2008). "American Physical Society". ^ "This month in physics history March 1, 1896 Henri Becquerel discovers radioactivity". APS News. 17:3. March 2008. ^ "The Discovery of Radioactivity". Guide to the Nuclear Wallcart. 9 August 2000. ^ Niepce de Saint-Victor (1857) "Mémoire sur une nouvelle action de la lumière" (On a new action of light), Comptes rendus ... , vol. 45, pages 811–815. ^ Niepce de Saint-Victor (1858) "Deuxième mémoire sur une nouvelle action de la lumière" (Second memoir on a new action of light), Comptes rendus ... , vol. 46, pages 448–452. ^ Frog, Max. "The man who Discover the world". Retrieved 13 April 2018. ^ a b Edmond Becquerel, La lumière: ses causes et ses effets, vol. 2 (Paris, France: F. Didot, 1868), page 50. ^ Henri Becquerel (1896). "Sur les radiations émises par phosphorescence". Comptes Rendus. 122: 420–421. ^ Comptes Rendus 122: 420 (1896), translated by Carmen Giunta. Accessed 02 March 2019. ^ Henri Becquerel (1896). "Sur les radiations invisibles émises par les corps phosphorescents". Comptes Rendus. 122: 501–503. ^ Comptes Rendus 122: 501–503 (1896), translated by Carmen Giunta. Accessed 02 March 2019. ^ "Benchmarks: Henri Becquerel discovers radioactivity on February 26, 1896". EARTH Magazine. 5 January 2012. Retrieved 13 April 2018. ^ "Rumford Medal". royalsociety.org. Retrieved 12 March 2018. ^ "Henri Becquerel". www.nndb.com. Retrieved 25 April 2018. ^ "Becquerel, Henri, 1852-1908". history.aip.org. Retrieved 12 March 2018. ^ Sekiya, Masaru; Yamasaki, Michio (January 2015). "Antoine Henri Becquerel (1852–1908): a scientist who endeavored to discover natural radioactivity". Radiological Physics and Technology. 8: 1–3 – via Springer Link. ^ "BIPM - Becquerel". www.bipm.org. Retrieved 13 April 2018. ^ "Planetary Names: Crater, craters: Becquerel on Moon". planetarynames.wr.usgs.gov. Archived from the original on 27 March 2018. Retrieved 13 April 2018. ^ "Planetary Names: Crater, craters: Becquerel on Mars". planetarynames.wr.usgs.gov. Archived from the original on 14 April 2018. Retrieved 13 April 2018. ^ "Becquerelite: Becquerelite mineral information and data". www.mindat.org. Retrieved 13 April 2018. Chisholm, Hugh, ed. (1911). "Becquerel" . Encyclopædia Britannica. 3 (11th ed.). Cambridge University Press. This page was last edited on 26 March 2019, at 17:32 (UTC).